When we announced AgFiniti’s prescription tool last fall, we knew it was just the beginning of many expansions. Now you can generate prescriptions for all operations! Check out the exciting prescription features coming to AgFiniti in March! The equation tool now allows you to build a planting recommendation for either corn or soybeans, based on a combination of your harvest datasets and the NCCPI from your soil survey information. By calculating the relationship between your actual field data and this index, the resulting prescription will allow you to define planting population for up to three yield zones. 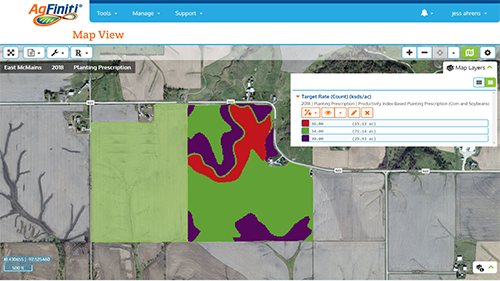 The new legend-based prescription tool gives you unlimited flexibility and control over all of your field operations by allowing you to generate a prescription based on any map within AgFiniti. 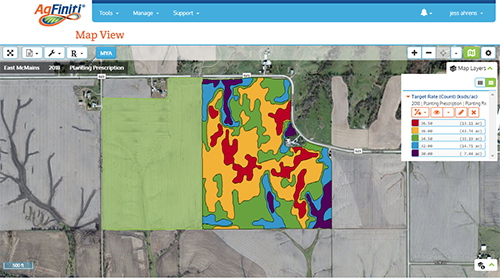 Included with AgFiniti’s prescriptions tool is a new Multi-Year Analysis map that generates average and normalized yield maps for all purchased fields with grain harvest layers in AgFiniti. Multi-year analysis maps are automatically generated and updated as new yield data is available and ready as an input to build prescriptions. All these new features are included – at no additional cost – in the annual prescriptions price of $0.75/acre. That gets you an UNLIMITED number of prescriptions for that field for the entire year! Demo these new features here. Want more info? We’re hosting a free webinar!